Following two years of negotiations, we are pleased to announce that a Mutual Recognition Agreement has been signed between the Canadian Architectural Licensing Authorities (CALA), the Architects Accreditation Council of Australia (AACA) and the New Zealand Registered Architects Board (NZRAB) under the APEC Architect Framework. 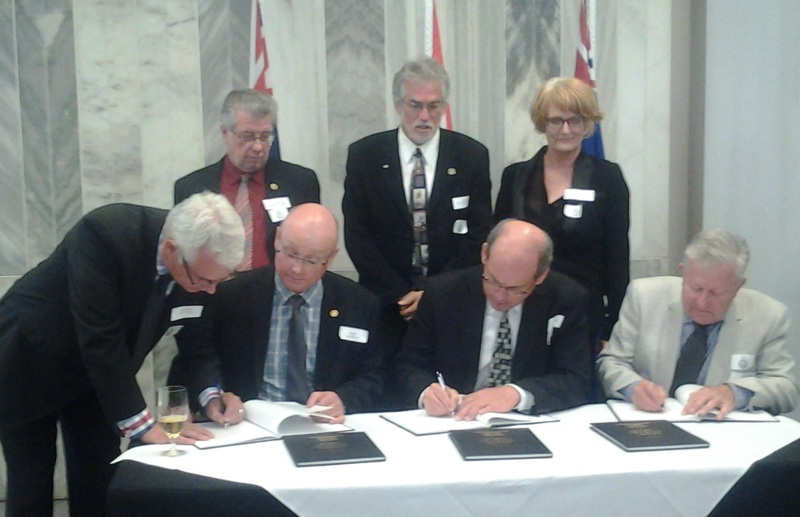 The signing took place in the New Zealand Parliament Buildings in Wellington on February 18, 2015. AIBC Council President Scott Kemp Architect AIBC, on behalf of CALA and its International Relations Committee, participated in the ceremony. The MRA allows for APEC Architects of the three economies to gain access to fast-tract registration/licensing processes. For the past two years, commencing in January 2013, Canada officially took on the role of project secretariat for the Asia-Pacific Economic Cooperation Architect Project, a two-year term that culminated in October 2014 with the Sixth APEC Architect Project Central Council Meeting in Vancouver and now, this MRA. Read the CALA press release and the final agreement. For more information on the agreement, including application processes, please contact Jill McCaw, IRC Committee of CALA at 613-290-0922. For more information on the APEC Architect Project, please visit www.apecarchitects.org.